Copan Ruinas is a Mayan archeological site in western Honduras. There is actually a small town about a mile from the site that goes by the same name. 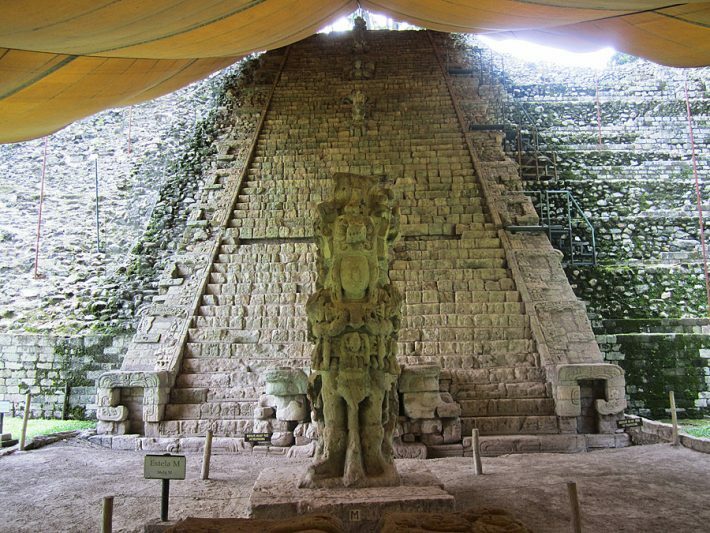 One of the first things I noticed when I visited was that the ruins are not quite as grand as the temples and monuments at Tikal, but the art and detail that has been preserved at Copan Ruinas is something worth seeing in itself. This photo is of one of the more impressive structures at the site that remains covered to guard it from weather damage. If you’d like to read the official description from the World Heritage website click here. Click here for a complete list of the UNESCO World Heritage Sites I’ve visited. It’s a worthy goal to make it one’s travel plan and visit the World Heritage sites. Makes for a RTW tour. That’s sort of my plan! I figured they must be worth visiting if someone put them on a list. I think they’ve left a lot of great stuff out though in exchange for a few rather boring stops. This one they got right. Bob and I really want to stop by several of these spots on our trip down through central and south america. book marking for when the trip gets closer! I definitely recommend Copan, but if you have to choose between Copan and Tikal, pick Tikal! The huge temples are incredible to see. Central America is a place that we’ve never been that is becoming more and more intriguing by the day. Love the picture! I loved Copan but would agree it didn’t have the same oomph as Tikal did, but I’m biased, since Tikal is my favorite ruin to-date. Would love to visit Honduras, seems like there is so much to see. Central America as a whole will be at the top of our next “to visit” list I think. Great photo and interesting statue! I honestly don’t know a lot about the Mayans but never realized how much influence they had all over Central America. Their influence is everywhere. There are TONS of people of Mayan decent all over the place, especially in Guatemala.